Glasgow Mid Argyll scored a double triumph on women's shinty finals day at Bught Park, Inverness. They lifted the women's game's supreme award, the Valerie Fraser Camanachd Cup, as well as the Marine Harvest Challenge Cup. Mid Argyll edged Badenoch and Strathspey 1-0 to retain their title as Scottish women's champions. That followed their reserves beating Ardnamurchan 2-0 on penalties after a 3-3 draw in the Marine Harvest final. Meanwhile, at Ballachulish it was 3-2 for the North over the South in the annual Under-21 inter-area match. The Valerie Fraser final produced little by way of scoring chances and the decisive goal was a scrambled affair. Just as extra time seemed likely, Joan Nicholson prodded the ball home from the midst of a melee. The Marine Harvest final was altogether different in the second half at least. Following a goalless first period, Lauren Pike opened for Mid Argyll early in the second before Kate Bradley then Carolanne Cameron gave the side from the Ardnamurchan peninsula the lead with four minutes left. But just as it looked as if the trophy was going to the West Highlands, Kirsty Gray equalised in the final minute and the game went to extra time. Here Geraldine Murphy gave the lead back to Mid Argyll before Cameron's second sent the tie to a shootout which the Glasgow side won. 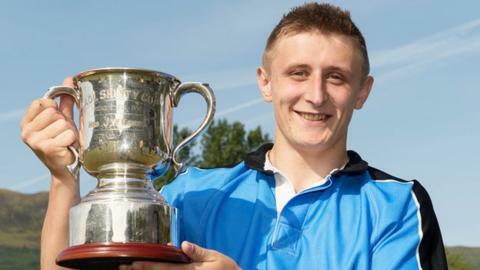 At Ballachulish, it was first blood to the South Under-21s in their bid to retain the Caol Cup when Glasgow Mid Argyll's Craig Anderson found the net just before the half hour. Connor Golabek (Glenurquhart) equalised just before half-time and Connor Howe (Oban Camanachd) restored the South lead in the second half. However, that lasted only five minutes before Kingussie ace Savio Genini pulled the North level again and clubmate Rory MacGregor grabbed the North's winner. The game is part of the selection process for the Scottish Under-21 team to meet Ireland on 24 October.